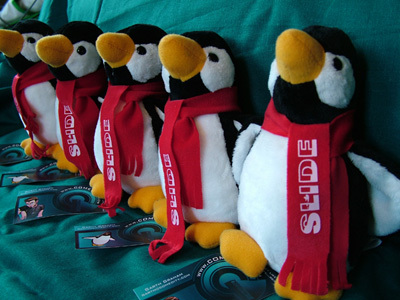 We started with just one penguin, but we quickly found ourselves swamped with penguins, armies of penguins! We can't keep them all, but there is hope. You can adopt one of these adorable little guys! That's right, you can take a penguin home today. Make sure to fill out one of our handy Adoption Forms (pdf). 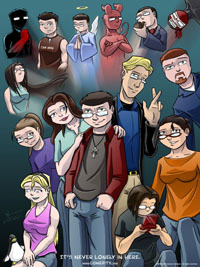 Finally Comedity comes to you in full color trade paper-back format! 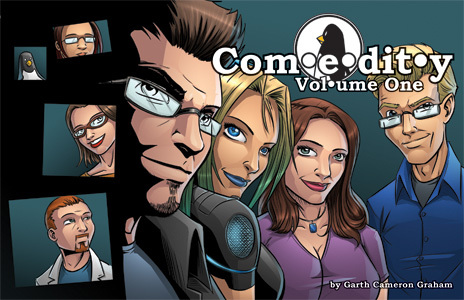 Read Comedity again from the very beginning, plus get access to all manner of extras including conceptual sketches, explainations to all the random trivia laced throughout the comic, and detailed biographies of the cast and crew. This item is in pre-order phase. Pre-orders are very important as they help fund the printing process. Books will ship when they return from the printers. Buyers will be notified via email of shipping dates. 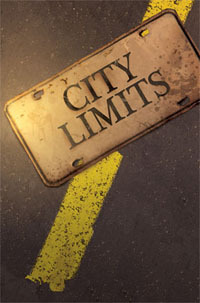 City Limits is a collection of a variety of short comics written and drawn by a number of very tallented people. 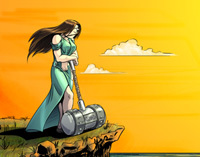 Who is to say what adventures lie in wait in the fictional city of Port du Ceil? 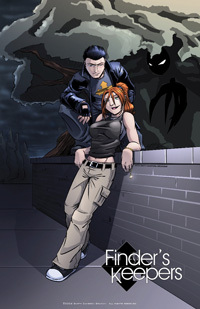 You can catch a preview of my entry, Finders Keepers. Because some of us bleed green, and it has nothing to do with the beer or being a vulcan. 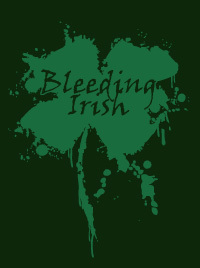 Order before March 1st to have this fine shirt arrive in time for St. Patrick's. Printed on forest green American Apparel shirts, if you are unsure of yoru size, please check the chart. 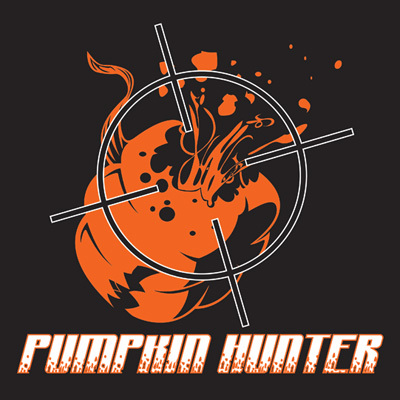 Out in the brush, lurks the wild jack'o lantern, ready to pounce an un-suspecting victim. But you're ready, you've got your twelve guage, and you're on a hunt. 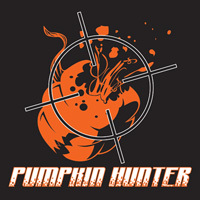 A Pumpkin Hunt. Available in Longsleeve. Alice isn't afraid to let the world know. 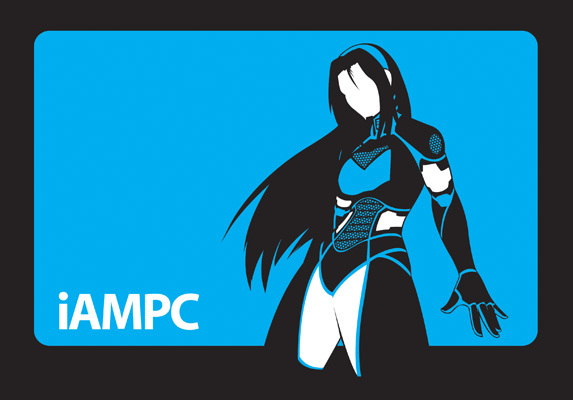 She's a PC, and she's proud of it. Are you with her? Printed on American Apparel shirts, if you are unsure of yoru size, please check the chart. Behold, the brand new Mark II Penguin shirt! 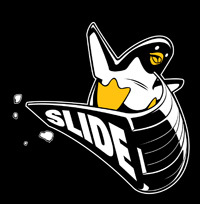 Complete with joyful penguin and his very own Tobbogan, so you can really show everyone how you slide. Available in both Men's and Ladies' cuts. Everyone's favorite violence machine now has his very own shirt. When it you just need to tell people to back off, or get into your hard-core gaming mode, #47 is there to back you up. Made from 100% preshrunk cotton. 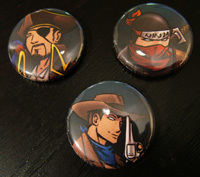 Now you can play your very own game of Pirate-Ninja-Cowboy, or display your personal favorite side with pride! Buttons are 1" in diameter. We are temporarily out of stock of Ninja buttons. Our appologies for the inconvenience. Collect the whole set! 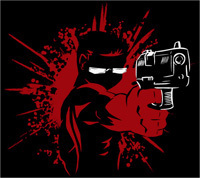 Including the Pirate Ninja Cowboy trilogy, you'll also get Alice, the Penguin, the Red Right Hand, <2% Geek, and Not I.T. Buttons are 1" in diameter. 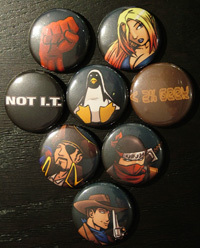 In addition you now also recieve the "Means Well," "Bad Influence," "GCG," and "Epic Proportions" buttons. This gorgeous 18x24" poster truly shows that it is never lonely inside the Comedity ... whether your friends be real or imaginary. Printed on extra heavy 10 point paper. Some of you may remember this amazing image from a wallpaper of years past. Now, you can own it as a gorgeous 11x14" print. Keep a little inspiration on your wall. Cailyn and Cardinal are up to their old tricks, dodging the Umbra lurking in the shadows, making snarky remarks to eachother, and trying their damnedest to not get themselves killed ... again. Take them home as an awesome 11x17" poster.